Attending a conference is an excellent way to network and gain contacts. As well as to glean valuable science and industry insights and to pass this information across to a team. However, many participants place all of their focus upon the event itself. There are several steps which should be taken after attending a conference to leverage its benefits in the most efficient manner possible. People like their opinions to be heard. Social media is arguably the single and most powerful tool that individuals possess to connect with other professionals and communicate. After attending a conference, many participants will post about their experiences via social media or blog articles. This is an invaluable means to appreciate what others have to say. We should also point out that linking out to conferences is an excellent way to strengthen a social media presence and to gain further contacts. Another post-conference suggestion is to actively follow up with fellow attendees and stakeholders via professional social platforms as well as emails. This action will help to ensure those firm connections to be maintained. Additionally, it could be wise to choose the social media networking possibilities that were established during the scientific or business conference. Use professional portals such as LinkedIn to connect with your peers and to build further digital contacts. Not only does this reflect a forward-thinking attitude, but also these very same connections can prove to be invaluable concerning future ventures. Organisers love to hear the opinions of their attendees. After all, this is one of the best ways for them to appreciate how their strategies influenced the event itself and how to improve in future editions. This should be performed as soon as possible after attending a conference, as memories and impressions will be fresh. Although it may be possible to meet with this individual in person, the more likely scenario is that you can offer online feedback in the form of a survey, an email or a contact. Let us also never forget that the simple phrase “thank you” will leave a lasting impression. After attending a conference, another critical step is to reconnect with your team and to discuss your (potentially mutual) experiences. Once again, these post-conference details can prove to be powerful tools to enhance your current operations and to provide invaluable insight which may impact your daily activities. Share all take away points with teams and if possible, reserve a block of time for an in-house meeting. This is particularly useful for those who may not have been able to attend, as they will likely have many questions. Try to analyse whether or not your goals were met after a conference has ended. How well did the sessions, the presenters address your questions? Moreover, what information were you able to glean from their seminars and meetings? The chances are already high that you walked away with a greater amount of understanding. Unfortunately, a significant part of this information will go to waste if it is not recorded and collated correctly. Record your impressions, highlight any turnkey solutions that were presented. Furthermore, note the names of those who you felt were pivotal in the success of the overall event. You will then be able to disseminate this information to other colleagues and stakeholders. 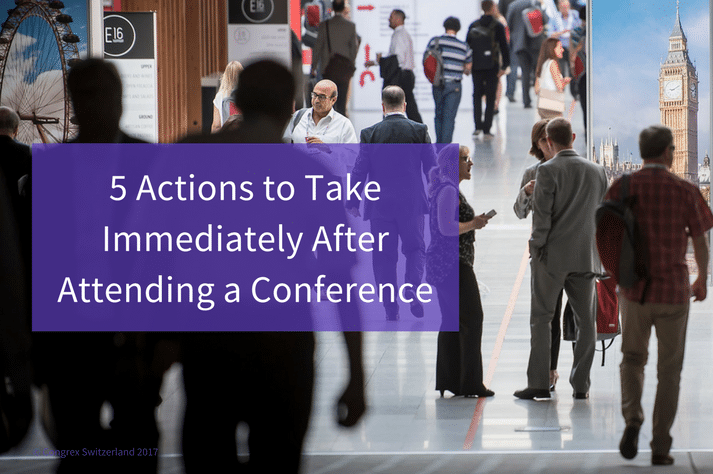 These five tips are all excellent methods to leverage the power of the modern conference. It is therefore surprising to observe that a significant number of delegates view these events as a one-off experience. In the worst case, as a means to socialise and nothing more. Conferences are intended to represent mutually collaborative templates which allow all stakeholders to connect and to gain further clarity and insight. An organised after-conference agenda should always be used to ensure that this particular experience would prove to be invaluable throughout time. Congrex Switzerland is an internationally operating agency delivering customised solutions. This encompasses the overall organisation of conferences and meetings including the management of hotel rooms and the strategic consultancy. Annually Congrex Switzerland organises approximately 33 events with over 73’000 delegates. Amongst our clients are international associations, governmental organisations and corporations.